Spa Manzanita is interviewing for potential candiates as a part-time to full-time spa coordinator and retail sales. The position is a very important part of the spa, you are the first person the guest meet when walking in the door or calling on the phone. You will be booking clients and helping them make choices in services and checking them out at the end of their day. We are a busy day spa open seven days a week. This is a part-time to full-time positiondepending on candidate, the hours can be 5 to 9 hours a day depending on the day. How many years of Computer Skills experience do you have? Are you in Manzanita, OR? The other day a person emailed us to book a couple services. I personally picked up this email about 15min after it came in. This was a new client because we always look to see if they have been to the spa before, if they have we call. I responded with all the normal questions: What is your full name? Can I have a cell number? And what time of day is best for you? I did not get a response….about 3 hours later, I emailed again (as we do) to be sure our email was received and if there was any other questions. I guess I am just really old fashion. Dang me for missing the days when you called a business and a human answered the phone and could give you all the information you need and maybe even share a laugh or two. Good “old fashion” communication, oh boy do I miss that. Well I am determined to not give it up in my life and my business. I am open seven days a week and we are here if you have any questions and want to be sure to book exactly what you want. It is expensive to go to a spa and I want you to spend your hard earned money in a way you will be happy. 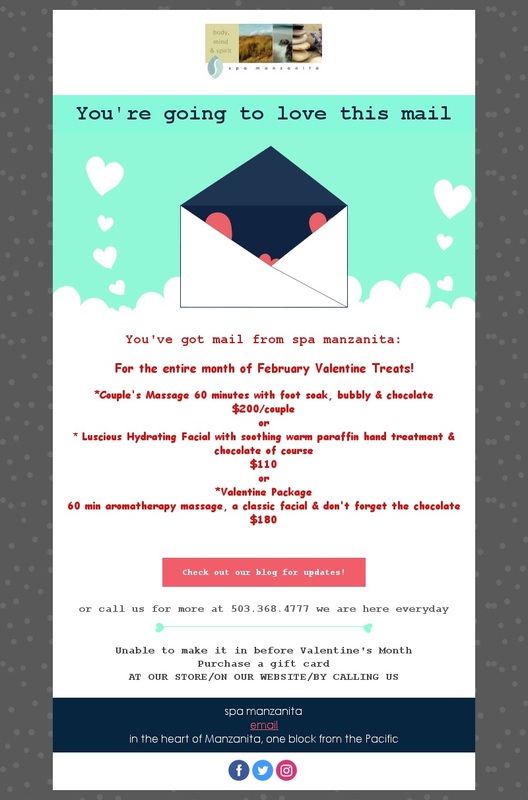 You might be booking a for a friend or spouse (they are the same), that has been to the spa before and we can look them up and help make suggestions as to what they might like. When you call us you might even have a question or two about the town like where to eat, what is going on and maybe something you did not think of. We are here to serve our community and to keep the flow of human communication alive. Yes we are in the business of CUSTOMER SERVICE.. call me old fashion, I’ll take it with pride. BOOK EARLY FEBRUARY IS COMING RIGHT UP AND LOVE IS IN THE AIR! 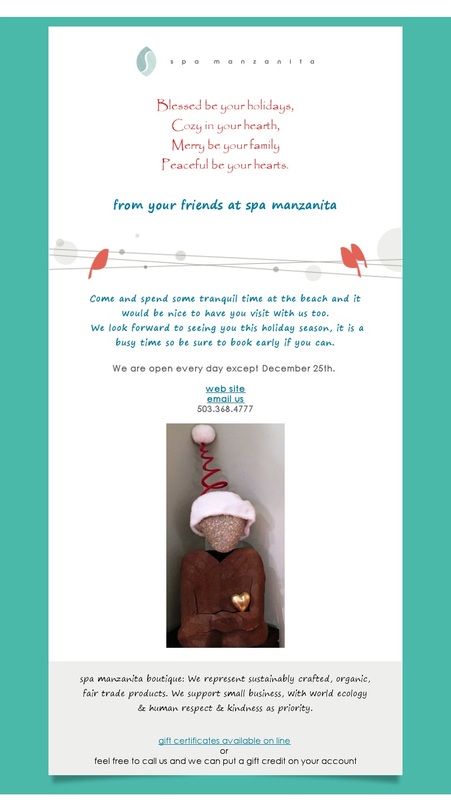 spa manzanita has always had a shop. We are now going to call it a boutique. Which means we are being much more selective and careful with our purchases. I came up with this part of our story out of the destruction of the spa this summer when we were closed due to water damage. For those clad in plaid!!! And a Raffle Entry for 3 gift cards of $25 value, no purchase necessary! Wear plaid or be sad! We are so excited to announce that we will now be selling some very special, carefully selected clothing items. Featuring comfort that we call snugginess and we are choosing eco/earth friendly products. Also searching wide and far for excellent fair trade items that honor and respect labor from abroad as well as US made products. Come by see and feel, we are open everyday! This morning I woke up early to start writing my thank you notes to those, (and I am very sure I am missing many) that helped out, supported and worked to put the Spa back together. During this assignment I came to pause and had a thought (it happens once in awhile). It hit me like a train: that this water inundation event (that’s insurance jargon), on July 20th that closed the spa down in a heartbeat was not at all a tragedy but actually a blessing and a bit of a life changer. Yes it created havoc, confusion and a pile of work but like I was saying; I was writing my thank notes and realized how fortunate I am and how wonderful people are. Kindness, generosity and the community of folks that just said “let’s chip in and get this done” was nothing but heartwarming. These were thoughts, experiences and feelings I had been getting hits of all along these last 8 weeks but I was kind of busy to take pause, but I was also aware that I felt “okay”. Just another bump in the road of life and a reminder to bend your knees to absorb the bumps, laugh a bit and take a moment and ask yourself “is this really so bad”? One more thing I learned, (thanks for indulging me) is to be a kinder person - now that is what I call a blessing! Exactly 4 weeks from the day the "water inundation" closed the spa to the day of reopening! "Change is inevitable. Will you drive that change or be driven by it?" We have endured a flood from the upstairs unit. This caused severe damage and we will be in reconstruction for the next couple weeks. Words cannot convey how sorry we are to share this news with you. I have been in business in Manzanita for almost 25 years and will continue, even stronger then before. Feel free to call or email or message me. I will continue to be working and available to all for communications. There is a good chance we can provide on-site massage, let me know if that is of interest to you. On the bright side the spa is going to look AMAZING when we reopen! Thank you for your support, we will see you soon.